SEO demands immediate action to protect Syrian civilians, and calls upon all international humanitarian and political institutions, including the United Nations Security Council, to condemn chemical weapons use in Syria. 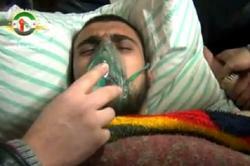 Chemical weapons have been used in civilian areas inside Syria, reported Al-Arabiya. On Sunday April 14, activists and physicians in the Sheikh Maqsood area of Aleppo reported that a woman and two children were killed when canisters containing a gas substance were dropped in the area from a Syrian Army helicopter. Physicians reported that victims had “hallucinated, vomited, had excess mucus and felt their eyes were burning." Other attacks with chemical weapons have been reported in different areas of the country, including Homs in January, and most recently the Jobar area, a suburb of the capital city of Damascus. On Tuesday April 12, British scientists found hard evidence that chemical weapons had been used in Syria from a tested soil sample. “There is clear evidence that chemical weapons are being used to kill innocent civilians and all manner of “red-line’s” have been crossed,” said SEO Board Member Bassam Jaafar. “We have reason to believe the Assad regime is behind these attacks from scientific analysis, eyewitness activist and physician accounts, and the continual irrational and brutal behavior of a regime that has been firing all types of weapons at the Syrian people, including Scud missiles,” said Jaafar. “Syria is believed to have one of the largest stockpiles of chemical weapons in the world. Assad has proven that his regime is either incapable of securing the chemical weapons, or is using them against the Syrian people. In either case, the Assad regime is ultimately accountable for any harm that befalls the Syrian people as a result of chemical weapons exposure and attacks."